With his soft voice and subdued body language, Peter Taub doesn’t especially stand out in a crowd. During intermissions at Museum of Contemporary Art concerts, he looks like just another bespectacled, reasonably hip art adventurer, one among the many drawn by the heady mix of unusual dance, music, and theater events in the intimate black box theater. 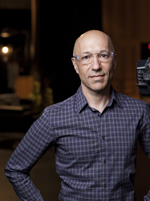 But Taub, director of MCA’s performance programs since the museum launched its first live series in 1996, is one of the most important arts programmers in Chicago. His annual series of approximately 15 productions emphasize the new and unusual. He has brought in artists and ensembles from all over the world, a range that has reached from South Africa’s Handspring Puppet Company to the Montreal-based dance company Compagnie Marie Chouinard. Like many live performance presenters, museums often find themselves in a cultural bind in their home towns. Ignore the local scene and alienate resident artists and fans who love them. Program too much local art and be dismissed as provincial. Taub has managed to find exactly the right blend of local, national, and international. The balance came about partly as a solution to a practical problem. To keep costs down, he regularly partners with local groups as he plans his seasons. In 1997 Chicago Chamber Musicians, one of the city’s finest traditional groups, launched a three-year series to bid farewell to the 20th century. Taub incorporated their concerts, titled Music at the Millennium and showcasing important 20th-century composers, into MCA’s series. Other multi-year commitments followed. Fulcrum Point New Music Project, eighth blackbird, and the International Contemporary Ensemble (based in Chicago in its early years) have all had residencies at the MCA’s 300-seat theater. Taub also has fostered collaborations between music groups and Hubbard Street Dance Chicago. At the same time, however, he has brought important national artists to Chicago music lovers. In 2011 ICE presented two John Luther Adams works in one evening. The concert opened with In the White Silence in the theater and then moved into an MCA gallery for an all-percussion performance by Steve Schick of The Mathematics of Resonant Bodies. The rapt audience listened while surrounded by an exhibit titled Without you I’m Nothing; Art and its Audience. Last spring Taub’s series included the world premiere of David Lang’s The Whisper Opera. No need for Taub to shout. His programming speaks for itself.